When the new caramel Milky Way candy bar appeared in stores I was ecstatic. I always liked the regular Milky Way candy, for its smooth silky taste (although everybody else considered me a fool, preferring Snickers). The new caramel Milky Way, is actually an improvement, and the reason why is simply the caramel itself. Years ago when I was small, you could get those individually wrapped caramels which were good, but caramel by itself is not as good as when mixed with or put over something, like cake or pudding. I like caramel on vanilla ice cream, and often make an easy caramel sauce. It is wonderful on bread or rice puddings, or cinnamon raisin toast too. Keep this simple treat in mind to enhance many desserts. Ahh this looks and sounds really good. Thank you for letting me know about the new candy! I'm gladly following your blog thanks to the A to Z challenge. 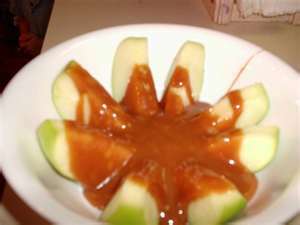 I love caramel sauce on apples! This looks scrumptious, elegant, and borderline healthy. Thanks, Anthony. I look forward to your next posts! omg one of my fave sauces...i make it too and oh wow it's heaven! Yum and perfect timing. It's a grandchild's birthday this weekend and this will be a balance between health and yumminess! Oh. My. I need to eat that picture immediately!